Humans are frustrating creatures and many claim to care but honestly don't or they wouldn't behave in the manner that they do. Their is a guy I see all the time when I drive to work, he always walks to Dutch Bros for a coffee, with his German Shepard and Yellow lab walking ahead of him. They know the way - they are completely off leash and he just walks along behind...recently he added a lab puppy, it totally freaks me out to see them all walking ahead of him down a sidewalk next to a busy street and bike lane...And we have leash laws! I really wish he would be fined for it. I find it especially scary when people have multiple dogs off leash because there is no way you are getting control of a situation gone awry. We have leash laws as well but so many people think they don't apply to them (and I was guilty of this myself in my younger, unwiser days). Having a reactive dog has made me recognize that even if my dog is friendly, others may not be. The unfortunate thing about that is, when my on-leash dog is reacting, the off-leash dog owner still thinks mine is the problem. I couldn't agree more with your post. However, I believe some of those that are supposed to enforce leash laws are to blame here as well. I can't tell you how many times I've heard/seen that park rangers have allowed people to slide on the leash law rule because the dogs "are so well-behaved". Dogs are dogs and if the right (or rather, wrong) circumstances present themselves - that well-behaved dog could swerve into traffic, run off after a child, attack another dog (leashed or unleashed). They are still animals and as such, we cannot begin to comprehend what they are thinking 100% of the time. It's so irresponsible - and you are right, those people that don't leash their dogs often DO have a swagger to their walk. I have often thought of just letting B off leash in the desert when no one else seems to be around - I'm 95% certain she would not run off. However, she'd no doubt get into trouble with a cactus. And if she saw a rabbit or coyote - that 5% would suddenly turn into 100% of her NOT coming back to me. It's simply not worth it. Yes, we have great resources now for getting our lost dogs back - but I very much doubt a pack of coyotes is going to give a rat's bottom that my dog is chipped or her flyer is everywhere and her picture on several social media sites. And even though Blueberry is a sweet, easy-going dog, when we get out of the car at the house, I clip her leash to my belt loop before even letting her out of the car. After having firsthand experience with a previous dog that wandered into the street and nearly was flattened by an oncoming car, even the front of my house is no place to let a dog free. I used to let my Chow mix, Lasya, off-leash quite a bit, before I was so sensitive to reactive dogs, and generally just less aware of how my actions affect others and how quickly things can go wrong. There's really nothing better than watching a dog run unfettered in a safe place. My folks had a big piece of property where my dogs could go free, but if my dad still had it l doubt I would let Ruby off-leash. Living near the mountains in Colorado I so often see hikers posting about lost dogs - the ones that "would never run off..." Like you, I no longer take any chances even with getting dependable Boca from the car to the gate. I know what you mean. I wouldn't call myself a mellow person; I'm just anti-conflict, but I feel that I need to be aware of all possibilities when it comes to our dogs, because the only person who will care is me. I 100% agree! It's just not worth the risk to me. I would love for Barley to have the chance to run free in places other than my parents' small fenced yard when we visit, and I'm sure that on the beach she'd probably be fine because she hates to leave my side--but the second another dog or a kid came into her sight, that certainty would be out the window. Like you, I wish that Ruby and Boca could run free but unfortunately there is nowhere safe for them to do so where I live. I, too, have a very hard time with laissez faire attitudes about dogs. I even see it in my close relatives. They have a Lab, and we did a hike with them and their dog a couple of months ago. As we got close to the trailhead, my husband and I leashed our dogs, even though it is at the dead end of a dirt road. I watched in silent horror as my relatives just let their dog wander into the road and wander around while they got their kids in the car etc. Nothing bad happened, that time... but they took a chance - and I don't like taking chances with my precious dogs. I have learned to relax myself to some extent for mountain biking with Shyla. I can't control everything (people, their dogs, wildlife), so I just focus on what I can control, which is Shyla's training and behavior. You may not know this about me - I don't talk about it much (I posted about it early on in my blog) but I had a dog who was hiking with me murdered by a drunk man years ago. 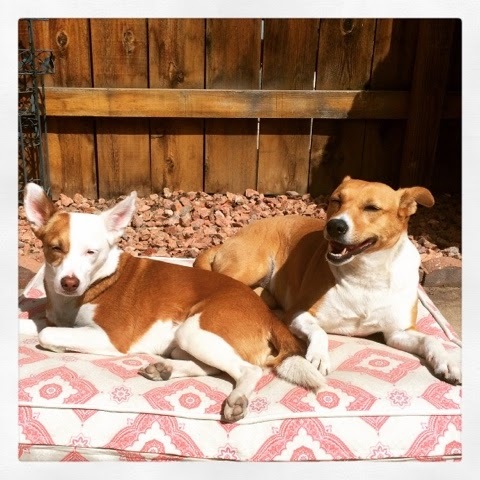 It took me a loooong time to recover (he was convicted of a felony but that didn't instantly cure my PTSD or grief), and part of that recovery was learning to give my dogs a little freedom again. But they get no freedom near roads or guns. I meant to reply earlier, KB - I did not know about your horrible experience, I can't imagine how scary and difficult that must have been to recover from. I admire your training efforts and it's obvious that your dogs are safe while enjoying some freedom. I wish that Ruby and Boca had more opportunity to run free, and it's probably the only reason I'd consider moving. I saw the man and the GSD again just a few days after I wrote this! Any benefit of the doubt I allowed was revoked. Like you, sometimes I wish I was more of an easygoing person and not so paranoid about what may or may not happen, but then I try to remember that I'm being responsible and reasonable. There are so many people around here who have off leash dogs, and they just think, "Well, my dog's friendly, so everything is good." They don't think about other dogs. They don't think about other people. They don't think about squirrels or birds or cars or even something as simple as their dog getting stung by a bee and freaking out. It's just so weird to me, and I really can't wrap my head around it. I wonder if these people really don't care or if they have the "Oh it'll never happen to me or my dog" attitude. You are right that it's not only a matter of keeping our own dog(s) safe, but having consideration for others. Some people are scared of dogs, others like us have reactive dogs, and even in remote areas, wildlife needs to be taken into account. Fantastic article. I learned this lesson the very hard way when I didn't leash my dog JJ from our front door to our car (he loves car rides). He usually is so excited to get into the car he goes straight to it. One day, he saw a squirrel and just took off like lightning. I thought I was going to have a heart attack! Thankfully, the squirrel was fine, JJ was fine, but I learned a valuable lesson. I've "lived and learned" over the years, too. I actually received a ticket for having my first dog off-leash in my neighborhood a long time ago. Even the most well behaved dog can act unpredictably.